After spending seven years living with a tiny town garden, moving to a property measured in acres rather than square feet was an unmissable opportunity, and I certainly have no regrets. I do have to chuckle, though, when I get the comment “Oh, you’re so lucky to have all that space for gardening. You can plant whatever you want!” Both statements are true, but it’s not all fluffy clouds and rainbows, you know. Having ample space for gardening creates ample opportunities for making really big mistakes. It seemed like a great idea at first. I was sitting in a lecture at a native plant conference two summers ago, and the speaker mentioned planting a hedgerow as a great way of attracting wildlife. Hey, I thought, I should do that! My property is bounded by roads on two sides, and there used to be established hedgerows on all four sides. In the process of getting the building permits, I had to agree to removing the road-side hedgerows because there were plans to widen the road in front. Really, I didn’t have much of a choice, but I’ve always regretted the loss of those hedgerows. Yes, they had rocks and barberry and a few Norway maples, but they also had flowering dogwoods, sassafras, sugar maples, native viburnums, red cedars, and a variety of wildflowers as well. Below shows what one of the remaining hedgerows looked like last September. I realized I wouldn’t be able to recreate the same effect in my lifetime, but I figured I had to start somewhere. The speaker had suggested starting a hedgerow by putting up two posts and stringing a wire between the two posts, the idea being that birds would perch on the wire and um, “sow” the seeds for you. It’s an interesting idea, but I wasn’t prepared to wait quite that long for results. 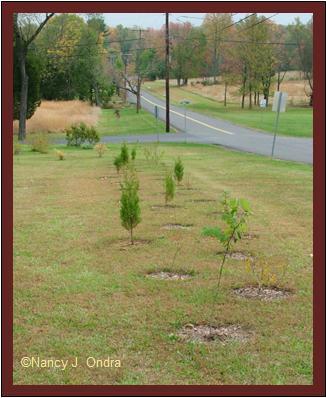 I had about 300 feet of frontage to fill and not much money, so I scavenged seedling trees from a number of sources: plant sales, my meadow, my nursery beds, and – yes, I admit it – some of those cheesy nursery catalogs that sell baby trees really cheap (you know, buy one tree for $1.98 and get two for $1.99). Remember, I needed a lot of stuff! I ended up with about 80 trees and shrubs. 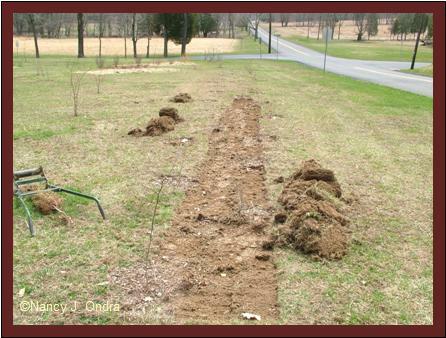 Along the front road, I decided to plant a continuous strip, with the trees spaced about 3 feet apart in three rows. I didn’t have enough to do a solid strip along the other road, so I created three sections there. Starting early one morning, I dug all the holes and got everything planted by dark that night. It was a little depressing to wake up the next morning, look out, and see only a lot of small holes in the turf: The trees and shrubs were so tiny that they were hardly visible. Needless to say, I endured a lot of teasing from amused neighbors. Never mind: I was still convinced it was a good idea – until a few days later, when I realized that I needed to trim around all 80 of those tiny little trees. Many, many times through the summer. By fall, shown above, I was beginning to re-think the whole hedgerow thing. So then, I came up with a great solution: replace the grass between the trees with perennials. I always have plenty of self-sown seedlings and divisions, and I had more than enough black-eyed Susans alone to fill the space. Or so I thought. I started removing the sod in the main-road strip (shown below), cutting carefully around each tree. Very quickly, I realized two things: 1: It was a really big space, and 2: It was going to take all summer for me to get rid of all the sod that way. So, time for yet another re-think. Finally, I accepted the fact that I’d be tottering off to a retirement community by the time these trees looked like the dense, diverse hedgerow I’d envisioned, and I decided the most efficient solution was to transplant all of the remaining tiny trees to the side-road hedgerow-in-training. Once they were gone, stripping the sod in this area was a whole lot easier; so easy, in fact, that I ended up clearing a space about 10 feet wide and 90 feet long. I’m pretty pleased that I was able to fill the entire border without buying any new plants. (Well, not pleased about the “not buying” part, but pretty happy with the “not spending money on” part.) 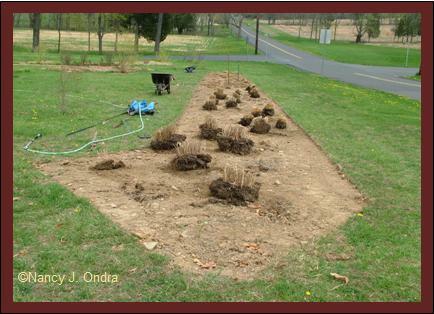 I started by placing large transplants and divisions of ornamental grasses – mostly various cultivars of switch grass (Panicum virgatum), and ‘Cassian’ fountain grass (Pennisetum alopecuroides), shown above. Then I filled around them with divisions and transplants of flowering perennials. Knowing that deer tend to wander in this area, I tried to stick with plants they’ve left alone in a nearby border: besides the grasses, there are black-eyed Susans (Rudbeckia fulgida var. fulgida), purple coneflowers (Echinacea purpurea), southernwood (Artemisia abrotanum), aromatic aster (Aster oblongifolius), Bowman’s root (Porteranthus stipulatus), Culver’s root (Veronicastrum virginicum), and ‘Lemon Queen’ helianthus. I finished a few days ago, and now that we’ve finally gotten a soaking rain, everything looks primed to jump into new growth. 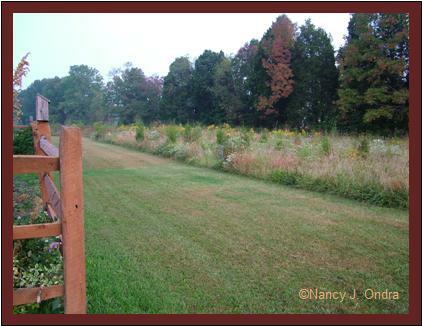 As a finishing touch, I added a few old fence posts, two of them topped with bird boxes purchased from a neighbor’s roadside stand. (So ok, the new garden cost $20.) Within a day, I noticed a pair of tree swallows had claimed one box and a bluebird was checking out the other one. I suspect it would have taken another five years or more for those tiny trees to be big enough for birds to perch on, so I’d say my goal of providing a new home for wildlife has already been met. And now, I have the fun of waiting to see how the border itself looks as it matures. At this point, at least, I think this planting’s going to be around for a while. OMGosh Girl. You have done a great thing here. 300 ft long. WOW You must be blessed with an iron back. Many kudos to you for this one. It has been blessed by the birds so it must be as it should. Well, to be fair, the border’s only 90-ish feet; the other 200+ of hedgerow-in-progress are along the side road. It was a joy to see the tree swallows come back; I usually get only one pair a year, and they’re so companionable and fun to watch. Thanks, Frances. Bear in mind that it did take me two years of scattered thinking and three weeks of focused work to get the border to this point. If I’d gotten it right the first time, it would be even better by now. But I do have high hopes for it by this fall. As much as I’d like to oblige you on your front garden, I think it’s splendid as it is, so I can’t begin to imagine how it could be improved! Starting with a blank slate is ever so much easier than reworking an existing space, I think. So much for the slow real-estate market, huh? Put up some new construction and you have new tenants move in before the landscaping’s barely finished! Wow, what an awesome border!!! And how satisfying to have done it from plants on hand and found a wonderful new space for them as well. Another triumph!!! Thanks! Though I wouldn’t have minded an excuse to buy at least a *few* new plants…. Nan, I am impressed at all your hard work. If it takes you several goes to get right there is hope for me yet! I think the biggest lesson here is to know when to dig everything out and start again. The result will be much better than just doing bits here and there, but brave! I suppose it would be even better to get things right from the start, but yes, admitting mistakes and trying again isn’t such a bad thing, at least in one’s own garden. I’m often asked why I don’t design gardens for other people. I think the answer to that is pretty obvious! At least you realized the mistake right away. Imagine if you had waited 5 or 10 years, then tried to move those little trees. I wish I could recognize mistakes that quickly. Good point! Though if I’d been patient enough to put up with the trimming chores for 5 or 10 years, I probably would have had a pretty nice hedgerow by then. It looks great and like an arrow pointing at the camera! You will be taking shots every two weeks so we can see the progression won’t you? I’ll bet on you at the next arm wrestling competition. Er, yeah, I know it’s a strange shape, but it makes sense (to me, anyway) in relation to the existing border and the borders-to-be near it. You bet I’ll be taking lots of pictures! It looks like you have a good start, even if it take some time to come up with the idea. I think it helps to live in a place for a little while and get a feel for what should be there. It would have killed me to see those sugar maples go. Did you use a sod buster for that area or just a good old fashioned shovel? Thanks, Dave. I try not to think about those trees that were lost, or about the 60+ other sassafras and sugar maples that were removed from my parents’ place a little further down when the road was widened a few years ago. I used my kick-type sod cutter to get rid of the grass for the border. It takes a while, but it’s certainly good exercise. Thanks, Gail! I note that you didn’t add “planning” to my list of gardening skills. I think I’d better work on that one! VERY impressive Ms. Ondra. Even more impressive for the fact that it took you three tries! Why does gardening always work out like this? I’ve been struggling the last two weeks moving plants–why did I plant them THERE in the first place? One I moved 1 foot–that’s crazy. But, I like your division thing going on. I find it hard to leave spaces, knowing that in a few years, or less, I can divide and get plants for free. And isn’t ‘Lemon Queen’ the neatest? Mine is coming up with twice as many shoots this spring. Merci, Monsieur Benjamin. You caught on quick to the plant-moving thing. It took me several years to move anything because I was so afraid of “hurting” the poor plants. I’ve long since gotten over it. Yes, ‘Lemon Queen’ is one of my favorites, and it’s a blessing for those of us who need height in a hurry and have lots of space to fill. I’ve found it does best when I dig out half or more of the clump every other year. (No need to dig up the whole thing – just pry out a shovelful or two on each side and fill the holes with good soil.) Even with that, I have to cut it back by half once or twice (either now and at the end of June, or just once in early June) to keep it from getting too large. But it’s worth every second. It looks like your plan really came together. Through the years I have rescued small seedling trees. It’s amazing how fast the years go by, and before you know it those tiny seedlings are large trees, and when they’re allowed to grow without the competion of surrounding trees, they seem to grow faster. It’s nice that you have pictures of their beginnings. You’re quite right, and I’m very glad I still have the other section of hedgerow to watch. With the addition of the trees I moved there from the now-border, it’s starting to look like something! I understand totally, Shady. I went from mostly shade to totally sun when I moved here, and it was like having to learn a whole new language: new plants, new combinations, new techniques, new skills. It wasn’t easy, but it was fun! Loved reading your story and learned about you from the NY Times. I’d love to see it up close and personal. Could you give me directions from Quakertown? Welcome, Janice! 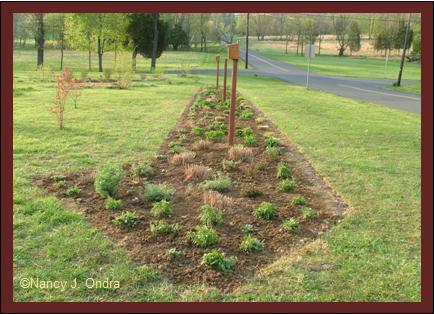 You can find directions to Linden Hill Gardens at the web site: http://www.lindenhillgardens.com. Look forward to seeing you there! What fun! Yes, I know about that trial and error thing, but I do think it will look great. Thanks for stopping by, Town Mouse! Uh…20 feet in a year? Wow. I could probably replicate that here in PA with a bamboo, but I think I’m better off as is.